The Programmable Controller Troubleshooting Workstation (890-PECB) teaches programming and troubleshooting of programmable logic controllers (PLCs) and their use in industrial, commercial, and residential applications. The PLC Troubleshooting Workstation teaches PLC troubleshooting like no other product by providing a hands-on learning station that models real world PLC-controlled machines with up to 40 faults that can be inserted into the system. It’s the first product to offer a realistic PLC troubleshooting experience for students, because the faults are inserted throughout the system, including inside the PLC! The PLC Troubleshooting Workstation has the qualities of a real-world machine with relay-controlled start/stop power station, terminal strip I/O test points, operator station, and machine automation station. Students study various applications with live devices by plugging in one or more of the many application panels available. Each application panel models an actual machine system, such as electro-pneumatic actuator, electric motor, analog devices, and BCD/LED display. Application panels are even available for interfacing external devices such as robots, conveyors, and process control systems. The PLC Troubleshooting Workstation supports training on multiple brands and models of PLCs, so one learning system can support training for many customized needs. The workstation console permits PLCs to be quickly mounted and connected. PLCs supported include popular modern PLCs, such as the Siemens S7 and Allen-Bradley ControlLogix. The system also requires the following application stations: I/O Simulator (89-IOS), BCD/LED (89-BCD-B), Electro-Mechanical (89-EMT), Electro-Pneumatic (89-EP), Operator Station with Programmable Display (89-OS-PDS), and Discrete Wiring (89-DWS). An External Interface Application Station (89-EIS) and PLC Expansion Package (89-MP) are also available as options. Amatrol’s exclusive FaultPro computer-based fault insertion software automatically inserts faults and tracks student troubleshooting efforts. Teacher intervention is not required, enabling teachers to work freely in the classroom. This system enables students to learn troubleshooting in a self-directed environment, allowing teachers to support more students. It is easy to use with menu-driven Windows-based software and provides a record to measure student learning. Automatic fault insertion avoids damage to the equipment that is normally associated with manual fault insertion. This makes the training equipment last longer and makes troubleshooting safer for the student and the teacher. 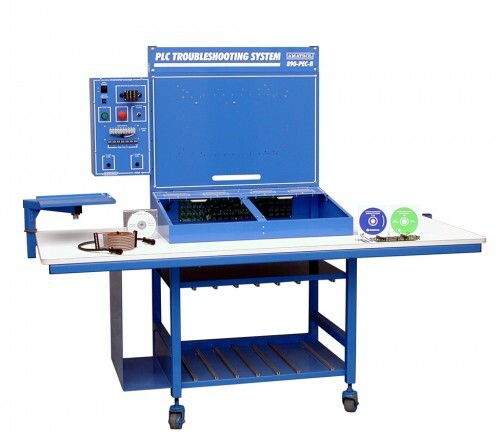 The PLC Troubleshooting Workstation includes a mobile workstation with PLC mounting console and work surface, computer-based fault insertion system, operator start/stop power station, field device unit with dual application panel mounting, and application panel storage unit. To support the curriculum, application panels, a PLC, and a fault kit must be added. The fault kit contains student learning materials for both theory and lab, as well as a teacher’s guide that applies to the brand and model of PLC selected. Additional learning systems are also available to extend student PLC skills to advanced PLC topics such as analog control, remote I/O, PLC networks, and PLC operator interface terminals.